I’ve always been interested in the flicks that made their home at the bottoms of drive-in double bills. Don’t Look in the Basement is my favorite of this variety and Garden of the Dead was made solely to wander below Grave of the Vampire in the early seventies. At one time I absolutely insisted upon owning every zombie flick I could get my hands on and it didn’t take much persuasion from Garden of the Dead’s cheesy box art to get me to buy this cheapie. I watched it and was unimpressed. A flick like this just has to get better from repeated viewings because it couldn’t get much worse. A brainwave I couldn’t fathom crossed my mind tonight and I decided to pick up my shovel and unearth Garden of the Dead to give it another shot at freshness. If I still find it to be stale, no worries… it’s not even an hour long. The days are long in prison, so an inmate has to do what he can to keep his mind occupied. At this particular old-style prison camp, the guys like to chill back and huff formaldehyde and occasionally ogle the girlfriend of a fellow prisoner. The guys aren’t going to take this shoddy, obsolete ol’ prison anymore; they’re gonna make a jailbreak. They plan it all out and take off one night, escaping from their bunks, conking a poor guard on the head and crawling through a tunnel that leads them clear out of sight. 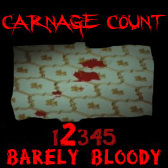 Eventually, the guards catch up to them and they prove no match for their shotguns. Each inmate is buried in a shallow, unmarked grave at the old prison boneyard. But, they don’t stay dead for long. The formaldehyde seemingly brings them back from their plots and armed with garden hoes and rakes, they break into jail to get even with the system that abused them! Garden of the Dead is one of those crappy movies that you have to tip your hat to because it at least tries to be innovative. In 1972, the zombie world hadn’t been completely Romero-ized and the living dead in this flick resemble their big brothers from Night of the Living Dead very little. There is no flesh eating and these lawbreakers don’t shuffle around like old fogies; the zombies grown from this Garden are quick and resourceful. Joe Blasco (who did the effects for Cronenberg’s Rabid and Track of the Moon Beast) supplies the ghoulish zombie makeup effects here, which mostly consists of discoloured faces and blackened eyes. They devise plans, carry weapons and even speak a word or two; not to mention act like a zombiefied lynch mob from all those films made in the thirties. Ever see a zombie dash out of the night with a pickaxe, swinging madly at prison guards? If you haven’t, you’ve come to the right place. All aboard the Teleme Train, this one heads straight to Cheesetown. On the other side of the coin, it does introduce a few unique elements to its zombie characters. The zombies have an extreme sensitivity to light and being hit by a strong ray will rapidly accelerate the decaying process. To combat this, the zombies use their brains and go back to the formaldehyde they enjoyed so much during breaks in the yard. They continue to douse themselves in the gas and this slows down the already accelerated process of decomposition. The film happens in the span of one evening, the sun doesn’t even rise by the time it’s over, so I’m not sure why the hell the prisoners were in such bad shape when they rose from their shallow graves to begin with (or why the hell there aren’t a lot more zombies since formaldehyde holds the power to life after death!). These are questions best not asked in movies of this nature; they were never intended to answer them in the first place. The acting is pretty bad (one actor appears to be the offspring of Mr. Burns from The Simpsons and Ted McGinley of Revenge of the Nerds) and the script is weak, but the film never drags thanks to its 58 minute running time. The first half of the movie is about inmates sniffing formaldehyde, smirking and plotting escapes, while the last half is just one big zombie attack with loads of shotgun blasts, goreless garden tool kills and tons of fog. The film definitely gets the tongue-in-cheek nighttime zombie attack right as it oozes with inexpensive atmosphere. The flick wears its low budget on its sleeve; the inmates identification numbers are merely written in black marker onto their shirts. The sole almost-gore effect consists of a zombie’s face falling apart a bit as he spews what appears to be toothpaste out of his mouth. 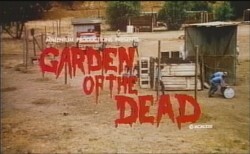 Retromedia grows this Garden of the Dead on DVD in its original 1.66:1 aspect ratio (non-anamorphic) with a disclaimer concerning the poor elements the film was mastered from. The colors bleed a lot and there are often blemishes, but in all honesty, it looks as good as a film like Garden of the Dead should look. 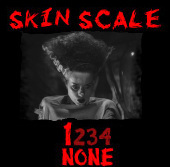 A no-frills mono track is included as well as an intro by a local TV horror host from Ohio named Son of Ghoul. He’s cheesy and terrible, yet passionate. In other words, he is right at home on this disc. Rounding out the extras was supposed to be a trailer for the film, but instead Retromedia received the one for Grave of the Vampire by error, and it is what they included on the disc. It’s not hard from watching Grave’s trailer to tell just why it was at the top of the billing when these two flicks debuted in drive-ins on a double feature. I ended up appreciating Garden of the Dead more this time around for doing its own thing, but make no mistake about it; these pick-axe waving formaldehyde junkies are good for a load of cheap laughs. If you dare… Rent it!